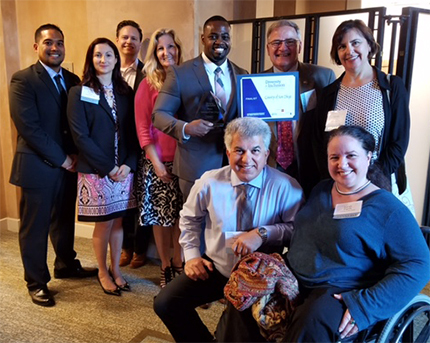 The County’s commitment to diversity and inclusion is getting some outside recognition: the San Diego Business Journal recently honored the County with a 2017 Diversity and Inclusion Award. Honorees were selected for their focus on D&I in recruitment and retention, supplier diversity, commitment by management, corporate/social responsibility and veterans affairs. “To be recognized as a local leader in diversity and inclusion, especially as the only government awardee, is really encouraging and exciting,” said Harris. Some highlights of the County’s accomplishments include the creation of several trainings on diversity and inclusion in the workplace, design of colorful displays and other promotional items encouraging employees to show their D&I pride, selection of 110 D&I champions to support the initiative, and participation in several outreach events. The committee also developed both internal and external websites with resources. During this timeframe, D&I efforts have touched thousands of employees. In less than two years, more than 2,000 employees attended D&I presentations and more than 6,600 employee received 15,679 hours of D&I training. Harris said this award reaffirms the County’s commitment to diversity and inclusion for its employees, customers and partners. “D&I is contagious. Share your commitment and the County’s with others,” said Harris. Learn more about the initiative on the Diversity & Inclusion website.